The table presented here was produced by the Environmental Protection Agency using data from the IPCC’s Second and Third Assessment Reports. It shows the average lifetime for seven main greenhouse gasses and their global warming potential. The global warming potential for all greenhouse gases is made relative to 1 which is the global warming potential for one molecule of carbon dioxide. For example, one molecule of methane (CH4) has a global warming potential 21x that of one molecule of carbon dioxide. These data basically represent the forcing potential of these gasses. 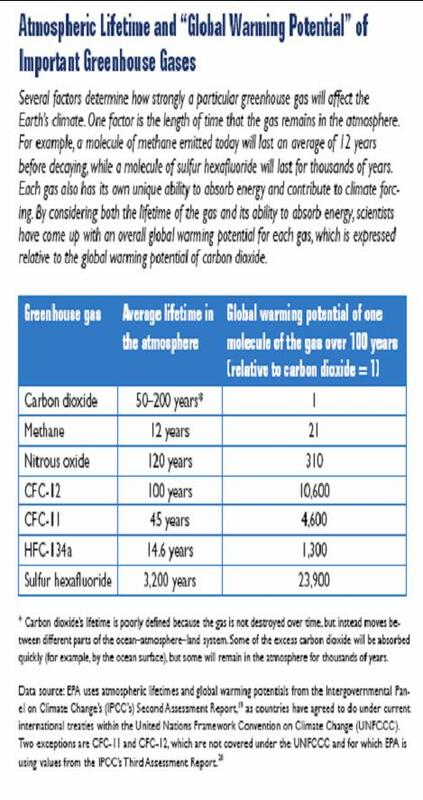 1.It should be made clear to the students that although other gasses have a greater warming potential than carbon dioxide it is carbon dioxide that is responsible for the majority of warming due to the large amount of carbon dioxide being introduced to the atmosphere via the combustion of fossil fuels. Have students review post, Carbon From Anthropogenic Sources. 2.Although carbon dioxide is responsible for much of the warming, there is increasing concern regarding methane. Have students research the effects of permafrost thawing as it is hypothesized that this may expose a large reservoir of methane that has been stored in the soil.